The Mariposa range by Charmian Beaton Design was winner of the Holden Designs of Excellence Award. Meaning Butterfly in Spanish, Mariposa is designed to have moving pieces to give an elegant fluttering effect. Award winning contemporary jewellery. 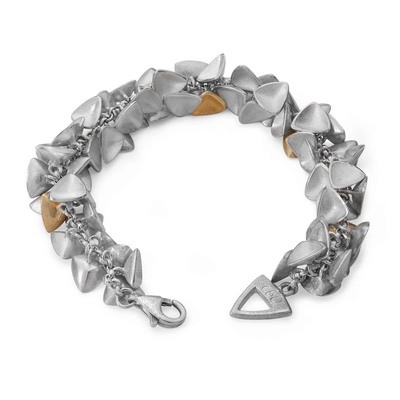 Stunning statement bracelet from the Mariposa range, this bracelet is created in solid sterling silver with 5 solid 18ct yellow gold sections scattered through the silver sections which all move independantly.